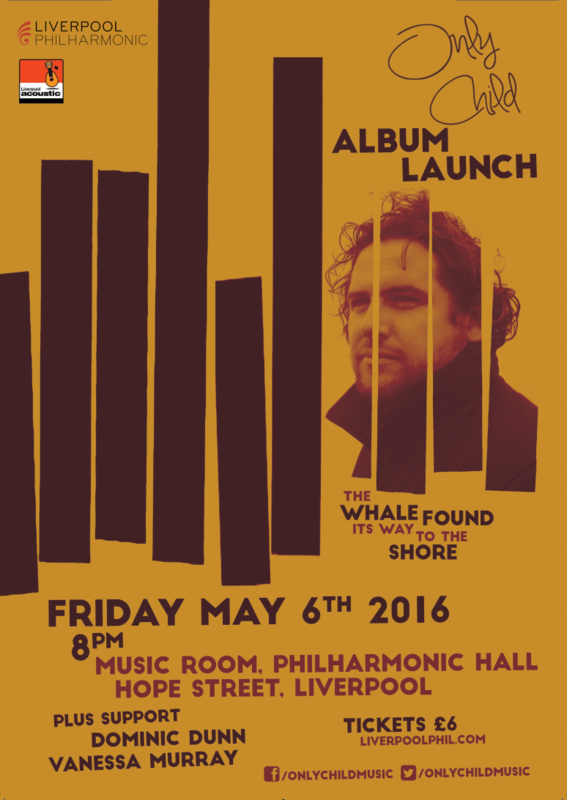 Liverpool singer-songwriter Alan O’Hare’s eclectic folk ensemble, Only Child, launch their second album, ‘The Whale Found Its Way To The Shore’, on Friday May 6th 2016 at the Music Room, inside Liverpool’s Philharmonic Hall. The ten track album will be available on iTunes and all other digital outlets from May 6th – but a limited edition vinyl replica CD will be on-sale at the big launch party. Support on the night will come from Dominic Dunn and Vanessa Murray. The Only Child all-star line-up will include the fantastic array of musicians who have all played their part in creating this varied second album – the follow-up to 2014’s acclaimed ‘From Muddy Water To Higher Ground’. Co-producer and electric guitarist Jon Lawton will join Only Child direct from a world tour with the million-selling Sami Yusuf; fiddle player extraordinaire Laura McKinlay will be back with the band following Ian Prowse and Amsterdam’s latest UK tour; Martin Smith will be leading a three-piece horn section fresh from success stories with The Weave and Michael Head & The Red Elastic Band and Vanessa Murray will be singing the harmonies following her impressive stints with LIPA and Operation Lightfoot. The band will be completed by bass, drums, keyboards and an Irish whistle player, to recreate the array of sounds heard on the the new record.